This Fourth Sunday of Easter is the annual “Day of Prayer for Vocations”. To be fair, we were invited to pray in a special way for vocations to the priesthood and the religious life, but true to the inanity of the conciliar church, this morning’s priest couldn’t help but witter on about us all finding our vocation in life. This to a sparse congregation the average age of which is seventy, and to which one might respond that if such persons haven’t discerned their vocation by now, they never will. Of course deflecting attention from a specific vocation to vows or sacred orders in favour of a general vocation to married life, single life, or maybe afterwards the Church, simply defeats the purpose, because every human being, Catholic or not, will either end up getting married or staying single anyway. The trick is to get them to stay single in order to serve God and His holy Church in a specific manner. That is the whole point of praying for vocations. We pray on this Sunday not that young Jimmy will make up his mind whether to get married some day or to remain single (perhaps in order to indulge in serial concubinage), but that the Lord will inspire the hearts of young people with a spirit of generosity, self-sacrifice and a desire to serve Him and His Church in vows or in holy orders. Laying out the priesthood and the religious life alongside all the other options really just focuses attention on those other options in the minds of those few young people who even hear the message in the first place. Framing the question in terms of “marriage or religious life?” just confuses people, and makes of religious life no more than an afterthought. If you go down to your local Opel dealer to view the new Insignia, he will be most welcoming and helpful to you, but he will not tell you about equivalent models manufactured by Renault or Toyota. He will talk to you of Opel, and only Opel. First decide whether or not you wish to buy Opel; afterwards, if you have not committed yourself, you can start thinking about Toyota. 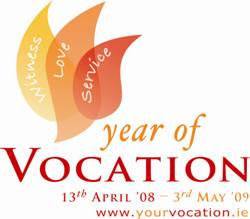 Anyhow, the ‘Year of Vocation’ announced on 13 April 2008 came to an end this Sunday. Without meaning to mock, or to throw stones at well-intentioned albeit clueless people who really haven’t a notion what they’re doing, Melancholicus does seriously wonder if the ‘Year of Vocation’ just ended has borne any fruit at all. There is no word on the website as to whether the year has been a success or a failure. To be fair, it is probably too early to judge such. The wretched blog still has the mere three entries it sported—one of which is to do with marriage, if you please!—when it was derided some time ago by the sorely missed and much lamented Smasher. So let us offer our prayers on this day for vocations to the priesthood and the religious life, not for some vague grandiosity that we will all somehow “find our vocation”. Many of us have already found our vocation, thank you very much. The Church needs priests, monks and nuns. She does not need Opel dealers recommending that their customers test drive the Toyota Avensis. Ie [sic] ask that we may know and follow the vocation to which you hove [sic] called us. We pray for those coiled [sic] to serve: those whom you have called, those you ore [sic] calling now, ond [sic] those you will coli [sic] in the future. “Coiled to serve” is a rather arresting image, is it not? Are we looking for serpents or shepherds for the Kingdom of God? And how about being “responsive to the coli”? What coli would that be, then? Hopefully not this variety. Get that in your bowels and they’ll certainly be responsive and no mistake. Sometimes it is wise not to trust the scanner too much.